Available in selected countries only, according regulatory approval. 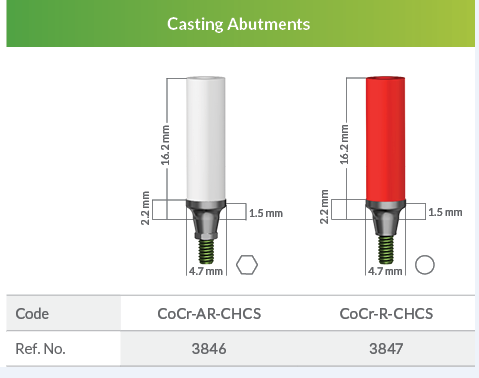 Ideal for customized prosthetic restorations, the casting abutments have press-fit plastic sleeves, while the metal base enables precise implant-abutment connection. Anti-Rotational (Hexagon): For use in custom casting prosthetic restorations on single or multiple implants. Rotational (Cylindrical): For use in custom casting prosthetic restorations on multiple implants prosthetic restorations.